Killer Characters: Happy National Dog Day! By Bella of Tracy Weber's Downward Dog Mystery Series! Hey all, and hi from Bella—star, protector-dog, and best canine hero of the Downward Dog Mystery Series! As far as I’m concerned, every day should be National Dog Day, but according to that mysterious thing humans call the World Wide Web, only one day each year is dedicated to us Bowser beauties—August 26th! Of course, I’ll spend the day getting my best human pal Kate Davidson into trouble. Our author friend, Tracy Weber will be hanging out in Seattle with her mischief-making pup, Ana. What will you do to entertain your canine companions? Did you know that many famous authors, including Maurice Sendak, Gertrude Stein, and Pablo Neruda spent their lives with beloved canine sidekicks? It’s true! 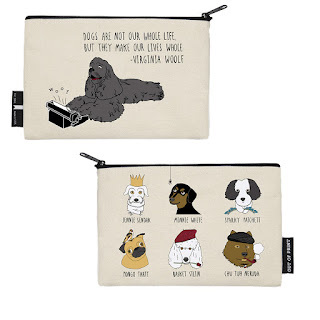 In honor of National Dog Day, Tracy is giving away a special edition “Out of Print” canvas pouch with cartoon drawings of Jennie Sendak, Minnie White, Sparkie Patchett, Pongo Tartt, Basket Stein, and Chu Tuh Neruda. Tracy purchased it at her neighborhood bookstore on Independent Bookstore Day 2017. A high fashion accessory like this is sure to turn heads anywhere you take it. Better yet, part of the proceeds from Tracy’s purchase will be donated to Best Friends Animal Sanctuary! To enter to win, leave a comment with the name of your favorite pooch no later than Wednesday, August 17. For extra credit karma points, give that pooch a cookie! Woof. Happy National Dog Day to dog heroes everywhere! I love all of the doggie names! Mr. Cuddles sounds like the name of a refined gentleman. Kelli, and yes she gets cookies. My favorite dog was my service dog Skittles. He crossed the Rainbow Bridge December 26th. ECAD is training a successor who will hopefully be home soon. Gusto! What a great name! My Dachshund Riley and Jack-chi (Jack Russell/ Chihuahua ) Piper are my two favorite dogs. I can't choose just one. My 4th birthday present was a black cocker spaniel named Snafu. The last dog we had was a lovely Samoyed named Dokie. My favorite dog was named Stitch. I lost her four years ago and still miss her every day. She was a black lab with special needs, she had a badly deformed back leg, but it never stopped her from doing whatever she wanted to do. We had ten and a half great years together and I will always remember how much love we shared. Joli! My 4 year old golden retriever and Ana's second best friend. I'm not entering to win just to mention Joli and say hi! Tyler and I agree, every day is dog day here in our home. Tyler is the sweetest boy that rescued me when my service dog Rufus passed away. I was stupid enough to say I didnt know if I could handle getting another dog. Well Tyler made me realize I needed another one. Now Tyler is not a service dog, nor could he ever be one, but he has enriched my life in so many, many ways. I could not have asked for a better pup! My dogs have sadly crossed the Rainbow Bridge. I've had Brioche and Barrett and later Sam, who I adopted when he was 11. All wonderful. Brioche was a 2 year old who had been at the shelter where I volunteered too long. She had stopped eating and started biting volunteers when they would return her to her kennel. I got Barrett at the same time, he was a 4 month old stray roaming the neighborhood where I was buying my first house. After losing them both (each at 13 years) I waited and decided it was time for a dog again. Working with Big Dogs Big Hearts rescue the fist dog wasn't a good match, but I found a dog through a different rescue in a different city and got Sam, a victim of divorce and a hateful new wife. Sam died at 14 years. For now...I'm dogless and sharing my life with 5 wonderful cats, as well as a rat and horse. Thanks everyone for the comments. Keep them coming! My two boys are my favorite pooches...Neo is a Boston Terrier and Lil'Man is a Chihuahua mix. They are so sweet...especially when I have treats handy! My Yorkie mix Teddy is my favorite pooch. He's 5 years old, smart, determined, and a snuggle bug. He loves to snuggle with me when I'm reading too. I've been a dog lover all of my life and I've had many beloved dogs. I had a Buddy as a child and another Buddy was my special protector as an adult so I will have to choose Buddy! One favorite is my neighbor's dog Onyx - she comes to my door every day for treats. I can't believe I mised National Dog Day yesterday! I am going to give my doggies extra belly rubs today! 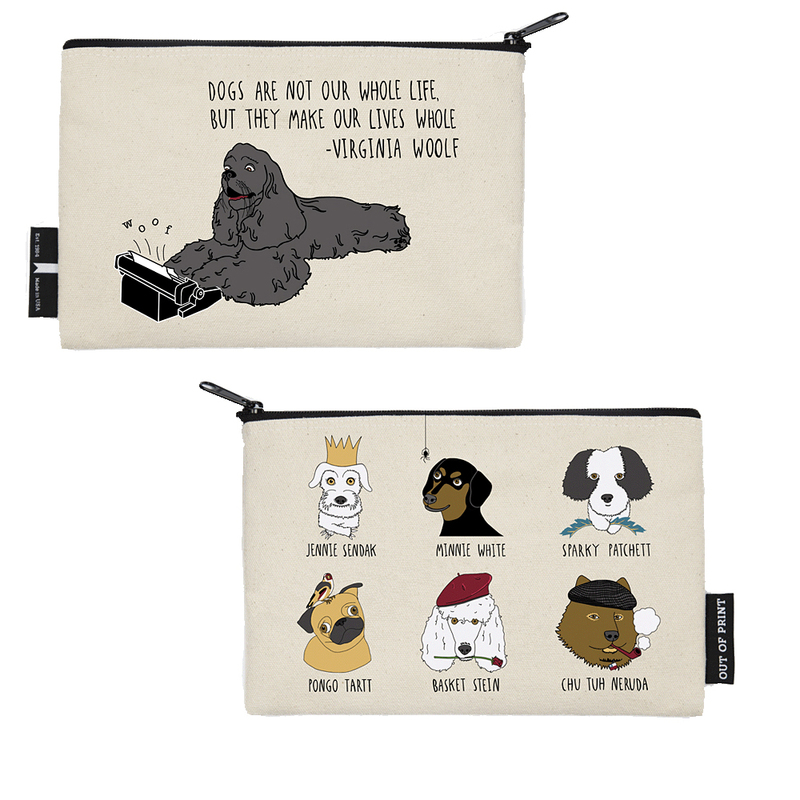 Thank you so much for the chance to win that adorable pouch! My favorite pouch of all time was my lady beagle, Angela, who passed last year. She and I were soulmates. My current pup, a fine beast for sure, is Arthur King of the Britons. I love all the dogs I've had over the years, but my favorite one was Cocoa. She was just such a very special dog, everybody loved her. My best friend Rocky was by my side for 15 years. A very smart Border Collie we got from a shelter. My husband taught him to bring in the daily newspaper. He's been gone for 13 years and I still miss him. The winner is Jewel! Jewel, please e-mail me at Tracy@WholeLifeYoga.com with your mailing address. Thank you!